A Japanese H-IIB rocket launches into space carrying the HTV-5 cargo ship on a mission to deliver 4.5 tons of supplies to astronauts on the International Space Station. Liftoff occurred at 7:50 am ET on Aug. 19, 2015 from the Japan Aerospace Exploration Agency's Tanegashima Space Center. A robotic Japanese cargo vessel launched toward the International Space Station this morning, embarking on a five-day journey to the orbiting lab to deliver tons of supplies and experiment gear, including a house for 12 mice. Japan's fifth H-II Transfer Vehicle (HTV-5) blasted off atop an HII-B rocket from Tanegashima Space Center today (Aug. 19) at 7:50 a.m. EDT (1150 GMT, 8:50 p.m. local Japanese time). 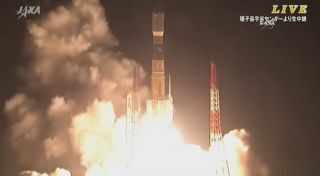 NASA broadcast live video of the HTV-5 cargo ship launch direct from the Japan Aerospace Exploration Agency, which built and launched the spacecraft. HTV-5's mouse house will eventually accommodate a dozen rodents, whose experiences aboard the space station will help researchers better understand the effects of microgravity on the bodies of mammals. Other scientific payloads include equipment for the ongoing "twins study" in which NASA astronaut brothers Scott and Mark Kelly are participating. Scott Kelly and Russian cosmonaut Mikhail Kornienko are about five months into an unprecedented yearlong mission aboard the orbiting lab that is investigating how long-duration spaceflight affects astronauts psychologically, physiologically and genetically. Mark Kelly is here on terra firma, serving as a control against which Scott can be compared. The two are identical twins, so they share the same genetic code. HTV-5 is also carrying an instrument called the Calorimetric Electron Telescope (CALET), which will be mounted outside the International Space Station to hunt for signs of elusive dark matter. So named because it apparently neither absorbs nor emits light, dark mater is impossible to observe directly with telescopes. But studies of the stuff's gravitational effects suggest that dark matter is more than four times more common than "normal" matter throughout the universe. CALET will also measure high-energy cosmic rays, which pose a radiation threat to astronauts in space, NASA officials said. Also aboard the Japanese freighter are 14 tiny cubesats built by San Francisco-based company Planet Labs, which aims to provide low-cost but high-resolution Earth imagery to a variety of customers. The cubesats, called "Doves," will eventually be deployed from the space station to fly freely. Today's successful launch brings the total number of Doves launched to orbit to 101, Planet Labs representatives said. HTV-5 was originally supposed to launch on Sunday (Aug. 16), but bad weather forced several delays. The Japanese Aerospace Exploration Agency's (JAXA) HTV vehicle is also known as "Kounotori" — Japanese for "white stork," which refers to the delivery function it serves. Four previous HTV spacecraft have supplied the space station, one each in 2009, 2011, 2012 and 2013. The HTV vessel is designed to burn up in Earth's atmosphere when its space missions are done, just like Russia's Progress freighter and the Cygnus vehicle, which is built by American aerospace firm Orbital ATK. SpaceX's Dragon capsule is the only currently operating cargo craft that returns to Earth in one piece. Editor's note: An earlier version of this story erroneously stated that 12 mice launched aboard HTV-5. But the freighter's "mouse house" was empty; the rodents will come up on a future flight.